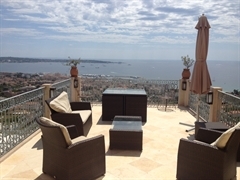 In front of the sea, located on a hill, the Villa la Corniche offers a unique panormama on the bay of Golfe Juan. This family house dated of the beginning of last century is decorated with frescos on the ceilings.The Villa proposes two studios with sight on the sea and on the garden. My wife and I, will welcome you and will advise you so that your stay will remain unforgettable. La Villa can accomodate 8-10 persons with the two flats. Accomodations for 2/3 persons with terrace, this flat is about 40 m². Perfect for 2 persons with summer kitchen, this flat is about 25 m².